Are you looking for an affordable Caribbean vacation? A relaxing family friendly holiday in your own comfortable private home with a private pool, attentive maid, housekeeping, chef and houseman services? Perhaps a place that offers the ability to totally relax and unwind well as having opportunities for adventure and excitement? This dream vacation does exist and can be found Villa Vista del Mar. This will become your family home to enjoy during your visit. This spacious family-style, child-friendly vacation villa has 6 bedrooms and 7.5 baths. Interior rooms are large, inviting and comfortably furnished for guests of all ages. Elderly guests can relax in a first floor master bedroom and still be close to the action. Young parents will find all the needed baby equipment and will be thrilled to find full time babysitters/ mothers’ helpers available for very reasonable prices. Numerous covered and semi-covered terraces and balconies allow guests to be indoors or outdoors regardless of the weather. A massive 3400 square-foot side-walled terrace provides privacy from neighboring homes. There are abundant seating options including chaises, rockers, conversation tables, hammocks and an ever-popular cushioned sun bed. A special metal security gate separates the pool and allows a measure of assurance for the parents of young ones. And if this is not enough, an expansive lawn around the home has plenty of open space for Croquet, Ladder-ball, Bocce, Horseshoes, Tetherball, Frisbee tournaments and more. Even the largest groups will find the room to spread out. A short 5-minute walk takes you to Cofresi beach, a sandy cove that stretches just under a mile. A reef protecting the beach provides a surf that is gentle, ideal for swimming or body surfing. There are no worries about rip tides, undertow, strong currents or large fish. Palm and Sea Grape trees line the beach providing plenty of shade from the strong tropical sun. You may find it difficult to pull yourself away from floating in the pool while sipping a pina-colada--one that is refreshed all too frequently by the maid. And you’ll enjoy alone time taking a nap or reading a book in one of several hammocks. Or you can chill out, de-stress on the upper terrace listening to the ocean as the masseuse takes over. There are so many ways to unwind. But, if you prefer a more active vacation there are plenty of tours and adventures including golf, casinos and a go-kart park. Visit Ocean World where you can swim with dolphins, sharks and sea lions; or try your luck at Ocean World Casino where you can dine in a 5 star restaurant and watch Las Vegas style shows... all just a 10 minute walk from our beach home. Explore historic Puerto Plata, 4 miles away. Or venture off on Jeep Safaris, Catamaran Trips, White Water Rafting, Scuba Diving, Snorkeling and much more. A local Cofresi tour operator comes directly to the villa to describe all options and provide booking services. Sample the menus at dozens of local restaurants…. You will fine everything from Dominican specialties such as langostino, conch and chivo or the usual favorites such as Filet Mignon, Chicken and Pork dishes and kid friendly hamburgers, tacos and pizza. There are countless adventures, activities and places for you to discover. While at the villa you will be pampered by dedicated long-term staff. Mercy is our cheerful, attentive full time maid who will cook and serve all meals, snacks and drinks. Don’t even try to get your own coffee! She keeps up a steady supply of beverages and whisks away all dirty dishes. She keeps the villa tidy and tends to your laundry. All you do is RELAX. Additional maids are brought in when there are larger groups to ensure all guests- moms included- enjoy a truly carefree vacation. In fact many females cry upon leaving because they cannot take Mercy home. Julio is our personable, friendly full-time personal houseman who keeps the gardens, pool, and home in pristine condition. He owns a large van to provide personal airport meeting service for our guests. Plus, he can be engaged to stock the kitchen with food and beverages so that icy cold beverages and tasty appetizers are ready to be served the momen you enter your vacation home. Julio is your go-to man for anything and everything. His ready smile and cheerful disposition will make you feel completely at ease. He has been known to entertain young children by catching small frogs, or picking mangoes and limes from trees in the yard, demonstrating how to open and drink directly from a coconut. Toddlers have enjoyed “helping” uncle Julio with his daily duties. And 'just in case' we have a full time manager available 24 hours a day to address your needs. If you need anything, the staff is there to help. The Dominicans have a well-deserved reputation for friendliness and hospitality; they go out of their way to make you feel welcome in their country. It doesn't matter if you don't speak Spanish. Many Dominicans now speak and understand a good deal of English, especially in the tourist areas. But you will also find that a smile or kind gesture will open many doors. For over 35 years, our guests have enjoyed the opportunity of interacting with locals and to experience the colorful culture of this country. If you have an adventurous heart and want a vacation that is slightly off the beaten path come to Villa Vista del Mar. Break away from the crowded confines of an all-inclusive resort… feel the freedom. Be prepared to relax while the staff takes over with the mundane chores. Wake up to freshly brewed coffee served to you on the terrace, and at night lay your head to rest on the pillow with a calm mind and a happy heart. Listen to the sounds of the ocean. Enjoy the moment. Life cannot get any better. My husband and I are beach bums... we grew up vacationing at seaside beaches. I spent summers at the (New) Jersey shore and my husband at Cape Cod MA. Although we constantly debate over which is the better place in the States (NJ shore or Cape Cod), one thing we both agree on is that Playa Cofresi, Dominican Republic is always the most relaxing and most unique place to vacation. Whether we are looking for quiet time floating in the pool or dozing in the hammock; or getting involved in a competitive lawn games, looking to snorkel at local beaches, or want to venture off on exciting adventures in the countryside there are always plenty of options. Of course having an attentive maid serving non-stop drinks and food is a big plus! Our 3 adult children ( plus grandchildren) have grown up at Cofresi and think of it as their 2nd home. They certainly benefited from the fun aspects-- the enjoyment of staff catering to their every need...but they also had the opportunity to live a different culture. They have learned to understand that there are many different ways to enjoy life despite economic status, and this education has been priceless. In 2006, Donald Smith (Cindy's father) passed away and the property & rental management transferred to Cindy. In memory of Don's passion for his beloved Cofresi home, for his devotion to his Dominican family, and for his love of this colorful country we will continue to cultivate his dream. We hope you will stay at our beautiful family home so that you can share our enthusiasm for this wonderful vacation destination. Villa Vista del Mar at Playa Cofresi has been our family's second home since 1982. We first traveled to this secluded unspoiled area back in the days when there were few tourists, supermarkets did not exist in town, horse-drawn carts were a common sight, and cows wandered about on our dirt roads. This all began when Lenore and Donald Smith, Cindy's parents, went on a business trip to the Dominican Republic in 1981 and visited the North Coast where they were told they would find some of the Caribbean's prettiest beaches. They became enchanted with Playa Cofresi and on the 'spur of the moment' decided to buy property. The original house was built in 1982 when there were just a handful of homes in this pastoral ocean-side community. When they retired in 1995, they spent more time in Cofesi made major additions and improvements to the villa to provide more spacious accommodations for their extended family. The property continues to grow and change with the needs of our family and guests. If you are looking for a relaxing, comfortable and affordable vacation... maybe something slightly off the beaten path you have come to right place. Villa Vista del Mar was built for comfort, fun and safety; and with expansive yards on all sides you will not feel the intrusion of neighboring homes. We have been in the hospitality business for over 30 years and have tried to think of everything to make your vacation run as smoothly and as carefree as possible. Our experienced extensive full time staff will pamper you to no end, but will also retreat to their quarters to allow you to have privacy. The maids will attend to all cooking, serving, cleaning and laundry starting in the morning with made-to-order breakfast and freshly squeezed orange juice. Throughout the day they will 'twist your arm' asking you if you'd like another pina colada while you are floating in the pool. Your most difficult decisions will be to decide what to eat and when to eat... The pampering does not end until they leave for the day... Or until your vacation ends Our full time houseman is available for airport transfer service, to run errands, to go food shopping and more. We have a manager available 24/ 7 for those “just in case” scenarios, and a local tour operator who will come to the house to help you with the multitude of activities, tours and adventures. You will be well taken care of by the many people who have become our 2nd family. There is a detailed Villa Orientation Book, Suggested Meal Planning Guide, Local Restaurant recommendations, Descriptions of Tours & Activities and more. When you arrive at the villa all you have to do is unpack and relax. Slow down. Go with the flow. Listen to the waves and songbirds. Admire the panoramic ocean and mountain views. Life is different, more relaxed. You will become quickly acclimated to the phrase 'no problema'. Hopefully you will enjoy every moment at your own private Caribbean home away from home. Villa is 125 yards to the beach, an easy walk down a gravel road. A rotating paperback library.. borrow a book, donate a book. Lawn and gardens surround the villa to allow privacy. 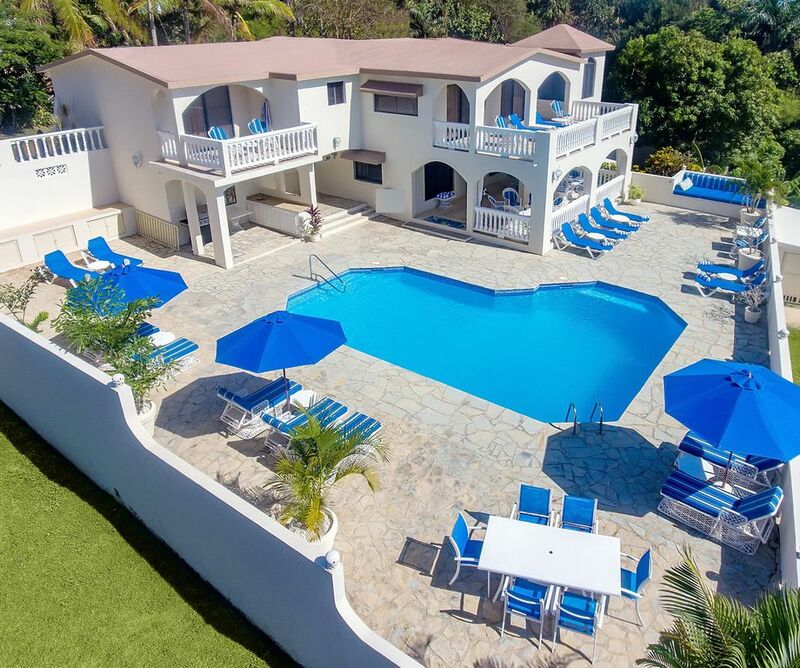 A large covered outdoor dining terrace, plus a cozy outdoor sun bed, plus a massive 3200 square foot walled sun terrace surrounds the pool ... easily accommodates very large groups comfortably. Though not technically handicapped accessible there is a 1st floor master bedroom suitable for elderly guests or those with mobility concerns. The accommodations were absolutely amazing. Every bedroom had a great view and bath! The staff made us feel like we were royalty, catering to our every need! The place was spotless and the decor was amazing and so very comfortable. Macie and Ingred made and served the most delicious meals and drinks. I am sure we all gained some vacation weight, well worth it.. Julio was a tremendous help in driving us to the local restaurants, attractions and shopping.. His service to and from the airport was just perfect, we were even able to squeeze in one more trip to the cable car before our return flight. The house was truly a resort, the pool was warm and crystal clear, great lounge chairs for suntanning or napping and also several hammocks! We made arrangements for some side trips, diving, waterfall excursion and even 4 wheeling on the beach and rivers.. We were amazed at how much we did in one week. One member of our party got ill and was able to get excellent medical care in a short time and was able to join back in the vacation fun. We have been to this villa in the past and upon returning it was even better than we remembered, so many new updates and improvements. All the bedrooms had king size beds and the ceiling fans kept you so cool, and if you really like it cold there are even airconditioners! The hosts were very helpful in suggesting excursions , shopping and restaurants. The best part was the service, they just seemed to know when to pour you another cup of coffee or refresh your pina colada. We all really missed the stall when we got home, they definately spoiled us. We only had 6 in our group but the house could accommodate many more, we are planning for a larger group on our next visit. We would like to thank our hosts Cindy and John Charters and the magnificent staff Julio, Merci and Ingred. Thanks again for a fabulous vacation. We spent 5 days in this beautiful home and we could have stayed forever. Everything looks exactly like the photos - the bedrooms were spacious, the house was clean, and the pool area was perfect. Mercy, Ingrid and Julio made sure we had everything we needed, and really made us feel at home. This is a perfect place for a relaxing, stress-free getaway. The whole process, from our first inquiry, was so easy. Cindy helped to get everything set up in advance so from the moment we arrived, there was nothing to worry about. We were a group of girlfriends, but I would also recommend this home for families or couples. It was PERFECT!! Amazing property but even more wonderful is the staff! We absolutely loved every second of our vacation. The house and the grounds are amazing. The pool and patio offers so much space and a variety of seating options for everyone in the family. Julio is amazing! He took such good care of us and responded to every concern we had and takes wonderful care of the property. It's amazing how fresh and clean everything looked! And having him take us to and from the airport was so nice and convenient. We adored Mercy and Ingrid as well! Mercy's cooking was awesome and we enjoyed every meal and Ingrid took such good care of us and making sure we had everything we needed from drinks to snacks. Your home is lovely (and the pool terrace amazing!) but its really Julio, Mercy and Ingrid who made a great vacation a truly wonderful and relaxing experience for all of us!! Vista Del Mar was located in a local setting surrounded by other nice property’s. Beautiful home. We loved the clean beautiful tropical home with the large pool and outside area. The maids and overseer took care of our every need. The food was excellently prepared. It was a great experience for our family. This villa was the perfect place for a girl’s trip to celebrate my 70th birthday. The staff was exceptional, always willing to accommodate whatever we asked. We took a couple of excursions, had massage therapists come to us but most of the time we were lounging by and in the beautiful pool. We did not discover the book that described the meals that were available until almost the end of our time there but what the staff prepared for us was always delicious. If you want a relaxing vacation I highly recommend renting this villa. You won’t be disappointed. If you desire a more active vacation, talk to the local tour operator about abundant adventures. Choose from a horseback ride into the mountains, a jeep safari to amazing waterfalls, a catamaran snorkeling trip along the ocean, try white water rafting, ride a cable car up the mountain, take the kids to a go cart park, play tennis and much more, There is a Robert Trent Jones golf course and additional casinos about 6 miles away.